Taxonomy: Description is on taxonomic level of family. Genome: Virions contain 14.5-16.08-17 % nucleic acid. Virions contain one molecule of, or two segments of Open circular, or linear double stranded DNA. Total genome length is 6800-7400-8175 nt. The largest segment 6800-7680-8300 nt. Genome sequence has terminal repeated sequences; direct terminal repeats; reiterated internally in inverted form. Genome has single-stranded discontinuities at specific sites. Transcribed strand has one discontinuity (or more). Non-transcribed strand has one discontinuity (or more). Guanine + cytosine ratio 28-35.5-43 %. Poly A region present, or absent. 3'-terminus has no tRNA-like structure. Non-genomic nucleic acid not found in the virions. Sub-genomic mRNA found in infected cells. Morphology: Virions not enveloped. Nucleocapsids bacilliform and isometric; 35-47.52-50 nm in diameter; 130 nm long, or 60-900 nm long; with a clear modal length (but can have a wide range); 95 nm long; 24-30-35 nm in diameter. Symmetry icosahedral. Surface capsomer arrangement not obvious. 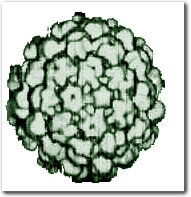 Caulimovirus Caulimoviridae/images/virus2.jpg"> cauliflower mosaic virus from the Caulimoviridae Database and Information System. Reconstruction of cauliflower mosaic virus surface structure showing T = 7 symmetry.